We left Camping du Letty on the morning of Wednesday 24 August to begin our journey home. We followed the D44 through Fouesnant to join the main N165/E60 and turned south east towards Lorient. Bypassing to the north of Lorient we turned onto the N24 towards Rennes. On the south western outskirts of Rennes we took the N136 to bypass Rennes on the western and northern periphery. We then joined the A84/E03 toll-free autoroute north towards Caen. At Junction 39 we left the autoroute for the 5 minute drive to Camping Pont Farcy. Seeing the amount of spare places on our outward journey we did not bother phoning ahead but just arrived. We were again given a friendly welcome by the lady warden who came out to open the high level barrier to admit us. We arrived mid-afternoon having driven 216 miles from Camping Du Letty. We were again allowed to choose our own pitch and were again to park our ‘van with the front window overlooking the river and again enjoy the lovely pastoral views over the river and fields beyond. The weather was good and we were able to sit out on the river bank to read and later enjoy our evening meal. We spent a peaceful night at Pont Farcy before leaving the next morning, Thursday 25 August, to continue our journey northwards. Unfortunately we missed our turning onto the A84 and had to continue along the relatively narrow roads to the small town of Tessy-sur-Vire. At Tessy-sur-Vire we were able to find a junction large enough us to allow us to turn around and retrace our steps back to Junction 39 of the A84. Our unintentional diversion was a round trip of nearly 8 miles. We continued our journey northwards on the A84. We bypassed Caen on its southern and eastern outskirts. We then turned west onto the N613 to avoid using the toll A13 road. Just west of Boisney we turned north east on the D438. South of Rouen we joined the A131/E46 to bypass Rouen. We had intended to pick up the route through industrial zone to the east of Rouen but we missed our turning and ending up bypassing Rouen along the ridge further to the east of the town. This route to the east of Rouen was a little more complicated but our satnav helped us through. North of Rouen we joined the A28/E402 autoroute in a north easterly direction towards Abbeville. At the end of the A28 we turned onto the A16 Toll road and stopped at the Aire de Baie de Somme for lunch. We had travelled approximately 190 miles from Pont Farcy. We were fortunate to find a space in the dedicated caravan parking area. After lunch, we continued our journey northwards joining the N901 northwards towards Boulogne. East of Boulogne we turned east onto the N42 towards St Omer. We passed through St Omer and took the D928 alongside the canal before turning following minor roads to Camping La Chaumiere at Buysscheure. We arrived at Camping La Chaumiere late in the afternoon of Thursday 25 August we had travelled 272 miles from Pont Farcy. Guy the owner was as brusque as we had found him on our stay at Camping La Chaumiere on our outward journey a month earlier. Guy showed us to a rather dark and shady pitch at the far end of the site. The pitch was a good size and we connected our Aquasmart system to the pitch’s tap giving us direct running water – the only time on this holiday. Guy remained as unhelpful as ever. An outstanding example of this was when, soon after our arrival, Cary walked back to Reception to order some bread for the next day. Guy took her order but demanded her pitch number despite the fact that he had just taken us to the pitch a few moments previously. 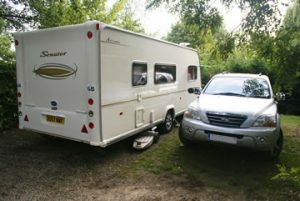 We stayed at Camping Chaumiere for 3 nights prior to our booking with Eurotunnel on Sunday 28 August. On Friday 26 we spent the whole day visiting the Ypres area. This was something I had been keen to do for a while. We drove through Cassel on the D933 and then took the N38 into Belgium to Ypres. We first visited the Flanders Fields Museum in the centre of the City. The centre of Flanders is filled with beautiful buildings all the more amazing because they are reconstructions of the original which were reduced to rubble during the First World War. The Museum using a variety of audio visual and other special effects to tell the story of the World War One battles fought in the area. Museum visitors could assume the identity of a character from the World War One period and follow a computerised “trail” through the Museum. I was given character of Noel Chavas. This was particularly moving for me as I already knew the story of this doctor son of a former Bishop of Liverpool who was won twice won the Victoria Cross for his valour in rescuing wounded soldiers under enemy fire. I had previously used his story in one of my sermons. We, also, visited the “York Trench” a recently excavated section of World War One trench and bunkers ironically now surrounded by industrial units. A particularly moving destination that we visited was the large Tyne Cot Cemetery near the village of Passchendaele. The rows upon rows of white headstones set on manicured lawns brought home the enormity of the sacrifice of so many young men. 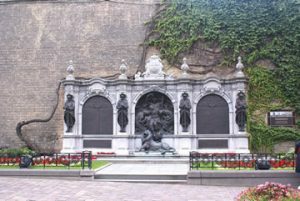 We planned our tour of the Flanders Fields World War One Sites Tour so that returned to the Menin Gate in Ypres for the daily Last Post Ceremony which takes place at the huge Menin Gate every evening at 8pm. 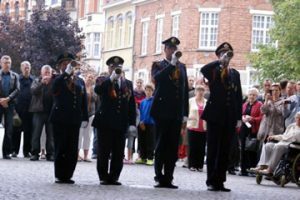 The police halt the traffic passing through the gate and 4 members of the local volunteer fire brigade sound the Last Post at 8pm precisely as they and their predecessors have done every night since 2 July 1928, apart from when the town was occupied by German forces during the 2nd World War. We parked our car in the town centre and walked to join the crowd for this short but moving ceremony. After the ceremony we spent some time looking at the memorial gate itself. This huge triumphal arch is inscribed with the names of 55,896 Commonwealth soldiers who were killed but have no known grave. It seems the Menin Gate memorial was actually found to be too small to record the names of all the missing Commonwealth soldiers and there are a further 34,948 missing soldiers inscribed on the memorial at Tyne Cot Cemetery. Ypres is a beautiful city architecturally although the World War aspect a little over commercialised with Flanders Fields “everything” including bars of chocolate with the poem printed on the wrapper. On Saturday 27 August we talk Max to the vet in St Omer to have the have the necessary treatment and to have his Pet Passport completed ready for his return to the UK. Madame Bernadette, from Camping La Chaumiere, is a receptionist at this veterinary practice and arranges appointments for many of her pet-owning visitors. The vet spoke fluent English and was friendly and efficient. We spent the rest of the morning looking around the city of St Omer including browsing the large outdoor market and the beautiful central Jardins Public (Public Gardens). During the afternoon we visited the pretty canal-side village of Watten. We, also, visited several supermarkets to buy approximately 50 bottles of Cidre de Normandie, doux. This is a favourite tipple of ours and we always bring home a large number of bottles to last us until our next visit to France!! On morning of Sunday 28 August we left Camping La Chaumiere and travelled to St Omer. From there we joined the N943 to the Eurotunnel Terminal at Coquelles, near Calais. Our departure time was 10.50hrs and we arrived in time to get Max’s Pet Passport checked. On arriving at the Eurotunnel we followed the “animal paw” to the special Pet Check-In. There was parking outside this building but not for caravan outfits and we had to overhang 2 car spaces. Max’s passport was okay and so we moved on to the vehicle check. We parked in the departure waiting area and took it in turns to go into the terminal buildings to the loos. Our loading onto the train was uneventful and again our outfit was the only one in the coach. This short journey to the Eurotunnel Terminal was 42 miles. We arrived back in the UK and drove smoothly out of the Eurotunnel terminal and onto the M20. When we reached the M25 turned west and negotiated it in a clockwise direction as we were visiting Cary’s Dad in Ruislip as we usually do. We made good time to Wyatts Covert Caravan Club site at Denham and arrived just after lunch time. The journey from the Eurotunnel Terminal had been102 miles. We spent a couple of days visiting Cary’s Dad and then on the morning of Tuesday 30 August continued home via the M40, M6 toll and M6. We arrived safely back in St Helens in the early evening. The last leg of our journey was 208 miles. Header banner image credit to No machine-readable author provided. The Beagle~commonswiki assumed (based on copyright claims). [CC BY-SA 2.5 (https://creativecommons.org/licenses/by-sa/2.5)], via Wikimedia Commons.